Canterbury House Publishing, Ltd, 9780982905494, 218pp. Fiona Batson shares with employer Janice Armstrong her compelling need to return to her childhood home in Peebles, Scotland. Thirty-nine years earlier, her 16-year-old brother, Duncan, vanished, and Fiona can bring closure only by searching for the clues that led to Duncan's disappearance. Janice refers the 55-year-old housekeeper to Yvonne Suarez, a travel agent who thwarted an international art theft ring, recovered the golden statue of Hera, and saved Janice's life a year earlier on a trip to Greece. 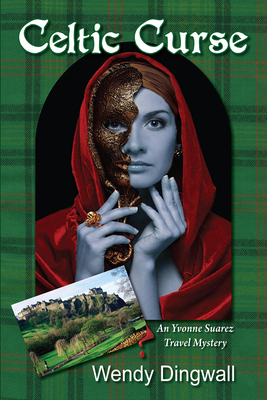 Yvonne has always wanted to travel to the land of Braveheart and Rob Roy. After hearing Fiona's tale of her missing brother, she decides to accompany Fiona on her quest and plans a trip to Edinburgh and surrounding cities to increase her knowledge of the area. While Yvonne is busy learning about Edinburgh home of the world-famous Edinburgh Tattoo, and Peebles, host of the nationally acclaimed Beltane festival she and Fiona are drawn into a cold-case investigation that soon leads to m.